Nowhere is quite like Africa. It is a truly remarkable and magical continent that enriches the soul. It has contrasts and diversity, outstanding natural beauty, vast open plains, vibrant cities and areas of pure wilderness. It holds some of the world’s greatest National Parks, home to an enormous variety of wildlife, and is the birthplace of safari. Sleeping out in the bush is Africa at its best, with each day bringing another exciting wildlife encounter and magical sunset. Waking to the sounds of the bush as the sun creeps into the sky and the thrill of spotting your first truly wild animal becomes engraved forever. Lion, hippo, buffalo, zebra, elephant, your camera capturing each special moment. Stopping for breakfast by the shrinking water-hole, your guide watchful of other thirsty visitors and the ever hopeful glance to the treetops just in case a leopard lies sleeping. We have a genuine passion for this beautiful place and its friendly people, and invite you to discover its splendour and culture. With our first-hand knowledge we can tailor-make the perfect itinerary to match your requirements and also offer you a little bit extra; perhaps a hot-air balloon drifting silently over the savannah or the chance to gallop through the shallows of the delta or maybe just a deserted beach to end the trip of a life-time. Whatever your choice we are here to help. It is important to note that for these safari camps the price reflects the quality of the camps and their uniquely exclusive locations. The prices do vary hugely with season and there are some great deals to be had if you travel just outside the peak times. We are confident that whatever your budget we will be able to book a safari experience that you will never forget. Handpicked selection of stunning safari camps across Africa, a truly authentic experience. Governors — Il Moran Kenya This camp is for those who want that extra bit of luxury and is an ideal camp for honeymooners and couples who are looking for a very special safari experience. Mombo Camp Botswana Mombo Camp is located in the Mombo Concession on the northern tip of Chief’s Island within the Moremi Game Reserve in the Okavango Delta, Botswana. Ngorongoro Crater Lodge Tanzania Ngorongoro Crater Lodge has been called the game lodge at the top of the world. With ever-changing views as mists swirl and clouds scurry over the huge wildlife cauldron below, the location is truly breathtaking. MalaMala — Rattrays South Africa MalaMala promises the finest game viewing on the African sub-continent and regularly provides the subject matter for a veritable collection of international and local wildlife documentaries (including National Geographic). 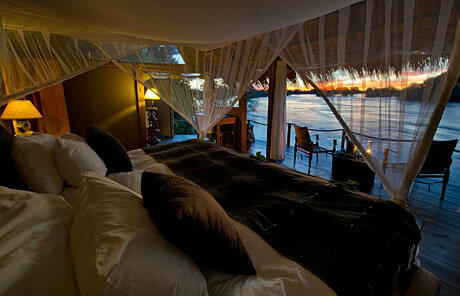 Tongabezi Zambia Tongabezi Lodge is a romantic hideaway on the banks of the Zambezi River just upstream of Victoria Falls.